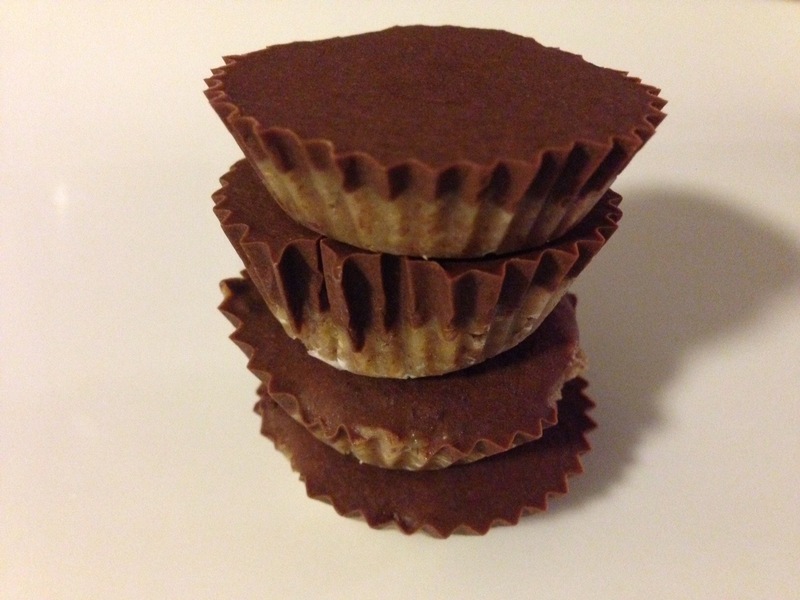 These little treats are quick, easy, a real crowd pleaser, and, with the addition of flax seed meal, even provide a little Omega-3 boost! In a food processor, begin to process the almonds and pecans. Let it run for several minutes until the nuts become creamy. Add in the flax seed meal, 2 tbsp. 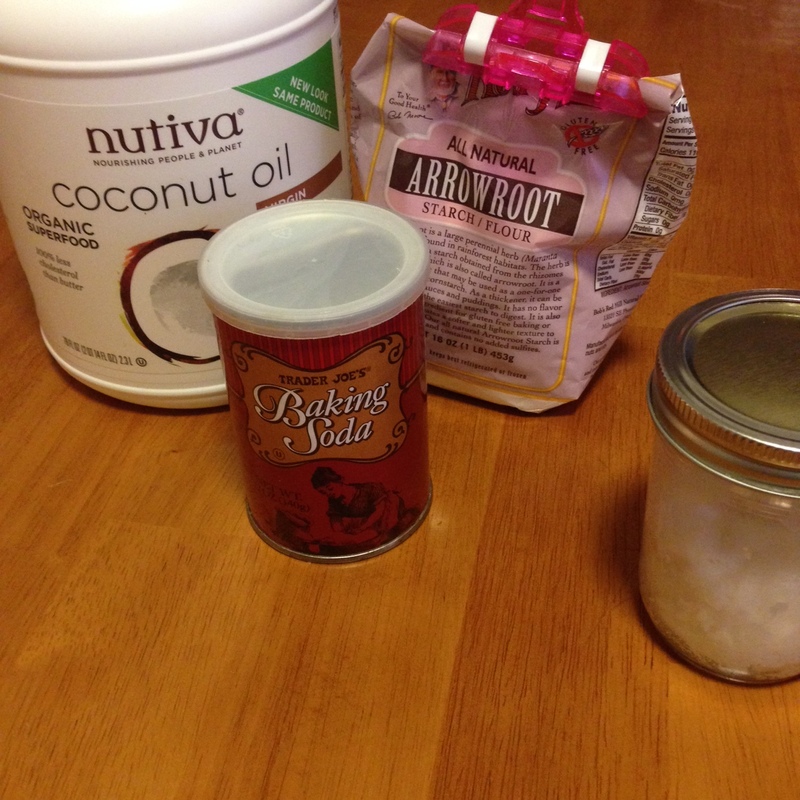 of coconut oil, maple syrup, vanilla, cinnamon, and salt and process for another 20-30 seconds. Line a mini muffin tin with parchment paper mini muffin liners. Scoop 2 teaspoons of the nut mixture into each liner and press down along the bottom. Wash out the work bowl and return it to the base. Process the chocolate chips until they become small, soft lumps. Add the last 2 tbsp. melted oil and continue to process until the mixture is a creamy liquid. Pour 1 teaspoon of the chocolate mixture on top of each nut patty. Place the entire tray in the freezer for 30 minutes. Eat them soon after removal from the freezer and store them there, since they will soften quickly at room temperature! This recipe doesn’t require too much of an introduction. It was amazing. We had an early “Christmas Day” at our house today, since actual Christmas Day will be somewhat unpredictable and on-the-fly this year. 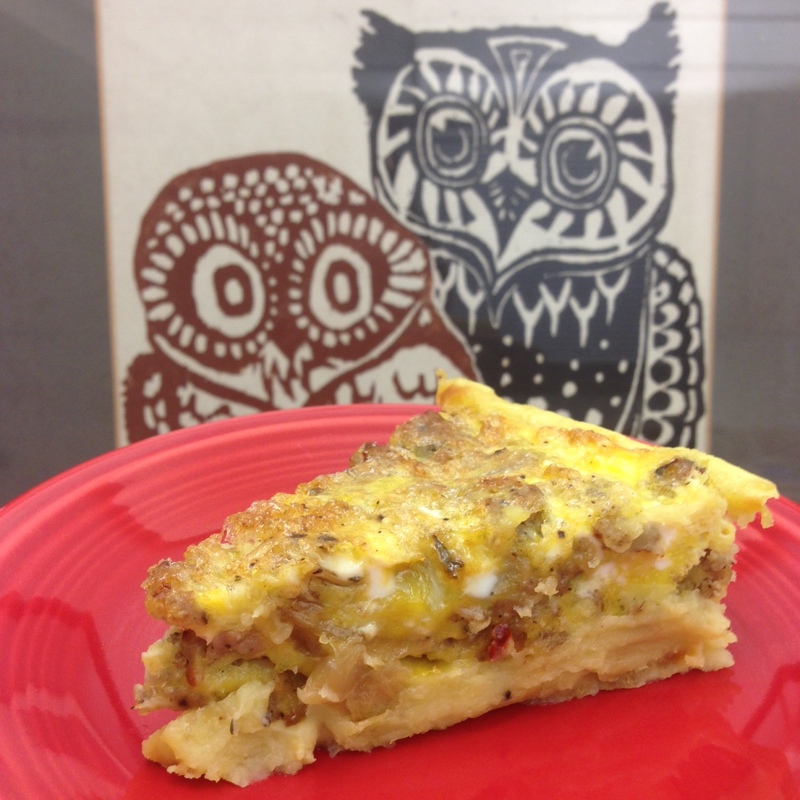 In honor of the occasion, I wanted something extra special for breakfast, and that’s exactly what we had! Melt the first 2 tbsp. butter in a pan over medium heat. Cut the top and bottom off the onion, then cut in half from top to bottom. Cut into 1/4” slices, then add to the pan, stirring to coat with butter. Continue to cook until the onions become translucent. Add the salt and thyme and stir to mix. Turn the heat to medium-low and continue to cook, stirring occasionally, for about 40 more minutes. The onions should be brown, but not crispy. While the onions are cooking, peel and chop the sweet potato. Steam or boil the pieces until soft, about 10-15 minutes. I used the steamer basket in my rice cooker. While the potatoes are cooking, heat up a second pan on the stove to medium, and brown the sausage. When the potatoes are done, put them in a food processor with the second 2 tbsp. butter, and season with salt and pepper. Process until smooth. 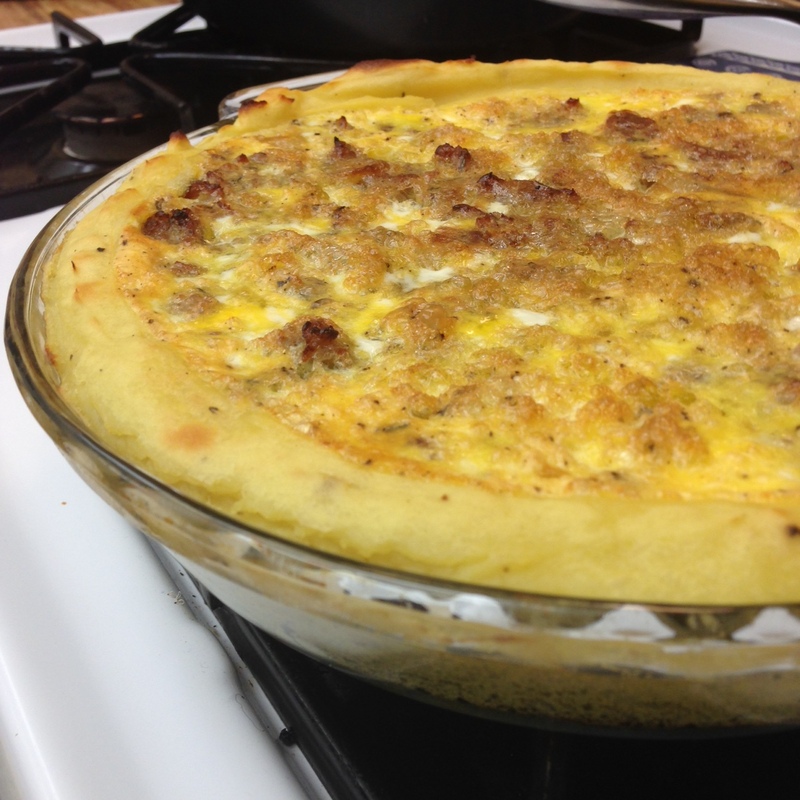 Scoop the potatoes into a glass pie dish, and spread them evenly across the bottom and up the sides of the dish. Combine the sausage and onions in one of the pans, then spread it all evenly into the pie shell. In a small bowl, beat the eggs with salt and pepper. Pour the mixed eggs evenly over the sausage. Bake for 15-20 minutes, until the egg is firm and no longer runny. Allow to cool for 5 minutes. Cut into pie slices and serve to anxiously waiting guests! I love the idea of eating “nose to tail”. This recipe really nails it as an intro to the “tail” end, but I haven’t braved up enough to attempt the “nose” portion. I’ve seen a recipe for pig snout, but there’s way too much ick factor there for me. I think I’ve warmed up enough to the idea of attempting tongue, but they’re so darn expensive! $25 for a slab of meat that has most certainly spent a good portion of it’s living existence picking a cow nose really baffles me. I’m not sure who’s driving up the demand for lengua, but I’ve heard it’s pretty good done right. For now though, I’ve just got tail. And I think this might be the best tail in town. Crockpot note: This recipe is big! I have to stuff it to fit in my 6-quart crock. In a large skillet over medium heat, crisp up the bacon ends and pieces. Remove bacon pieces from the pan to the crockpot using a slotted spatula or spoon. In batches with tongs, brown the top and bottom of each large oxtail piece, and the sides of the smaller ones, in the reserved bacon fat. As they brown, remove from skillet and add to crockpot. Add all the veggies and seasonings to the skillet. Stir to evenly distribute fat and seasonings, and cook until veggies just begin to soften and brown. 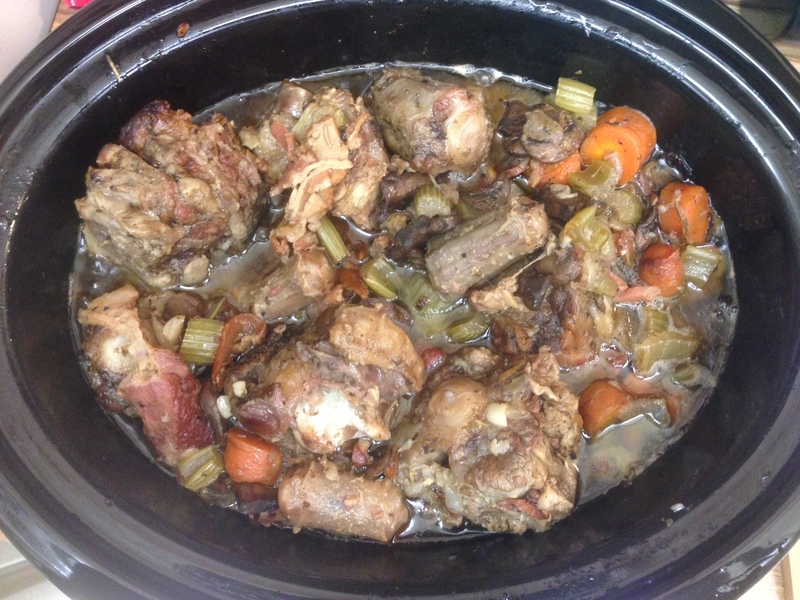 Top crockpot meat with veggies, put lid on, and set on low for 6-8 hours. 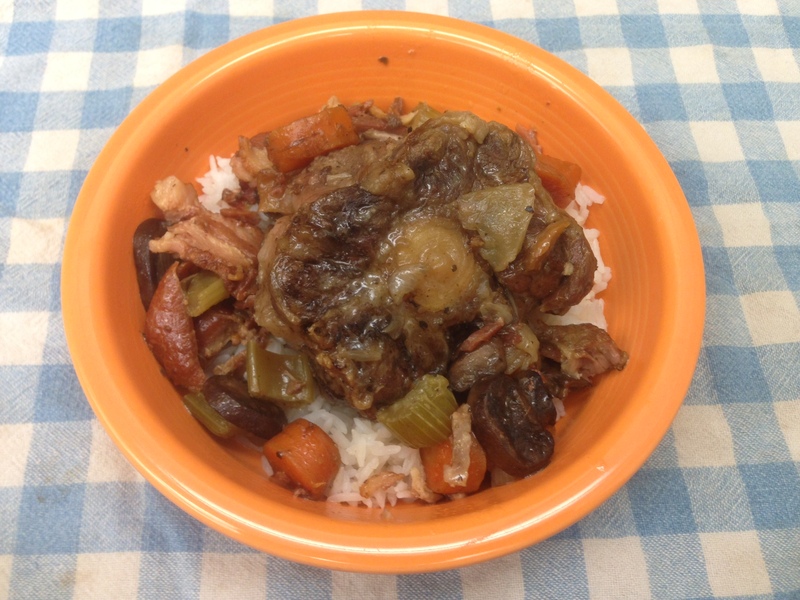 Serve alone like a stew, with a green salad, or atop starch of choice. I love butternut squash all year, but they are extra-perfect in fall. I have a few recipes for them that I’ve been working on and aren’t quite ready. This one I threw together a year ago, and it was wonderful on the first try. Because of the apples, it’s even more fall-ish, which might be why I waited an entire year to bring it out again. The addition of chicken or turkey makes it a nice hearty main course, but you can leave that out to make it as a side dish. With veggie peeler, peel squash. Cut in half, scoop out seeds, and chop into 1 inch chunks. Peel, core, and chop apples. Chop onion. Line a baking sheet with parchment paper. 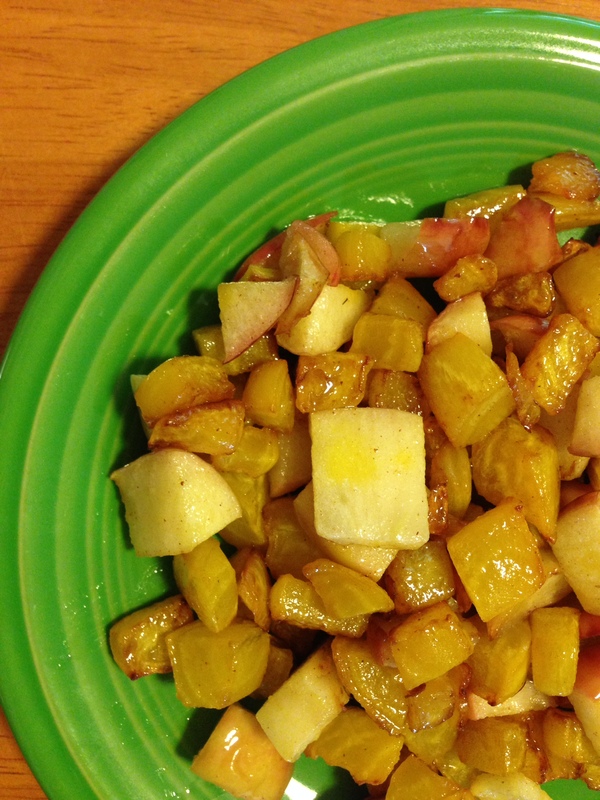 Cover with chopped squash, apples and onions. Drizzle with avocado oil, season with salt and pepper, and mix gently to coat. Roast for 30 minutes, stirring after 15 minutes. Edges of squash should be just browning. 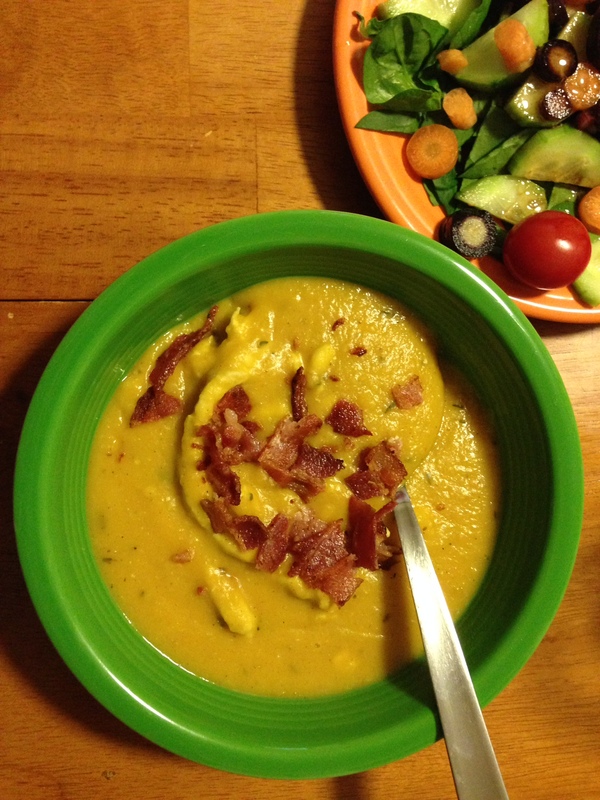 Blend squash mixture with 1 can coconut milk in a food processor or blender in batches, if needed. Pour in saucepan on medium low. Season with garlic powder, thyme, sage, nutmeg. 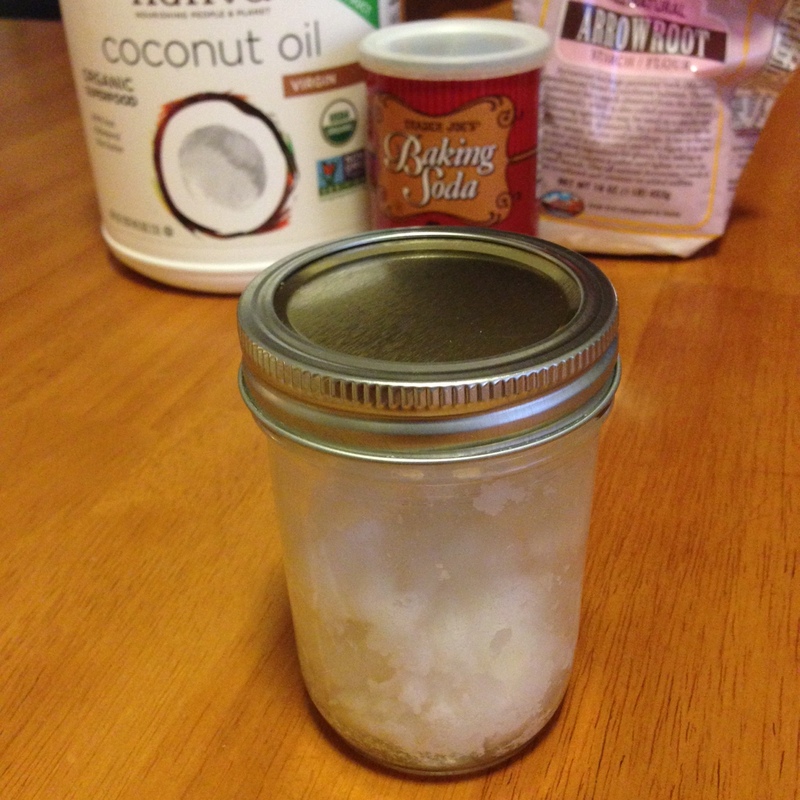 Melt the 1 tbsp coconut oil in a pan. Add the chopped turkey or chicken breast, season with salt, pepper, and garlic powder, and cook through. Add to soup. Thin with water if desired. Crisp 1 slice bacon per planned bowl. Dish up and crumble bacon on top to serve. I’m on a perpetual quest to redeem and elevate the reputation of the most despited vegetables. The ickier they are perceived to be, all the better to experiment with. I’ve had my hits and misses. With the hits, there are no leftovers. Or if there are, I end up picking them out of the pan until there aren’t. With the misses, the leftovers sit sadly neglected in tupperware at the back of the fridge until trash day. Trash day is really a funeral procession for culinary failures. But back to experiments. Veggies deserve a better reputation. They come in every color, they’re packed with vitamins, and they grow out of the ground. By themselves! That’s awesome. Not everyone gives them such respect though, particularly not my not-huge-vegetable-fan taste testers. And they are a discerning group. A critique of “That wasn’t too bad”, I consider a green light to make the dish again in the future. If they indicate in any way to have actually enjoyed the dish, it’s basically fit for royalty. This recipe went over pretty well. Not bad for a lowly beet. Add chopped beets. Cook in butter, stirring occasionally, until just softened and beginning to brown on edges, 8-10 minutes. Add chopped apple, season with salt, and stir to incorporate. Continue to cook, stirring occasionally, until apple softens, another 5 minutes. Serve to beet skeptics. Make sure you have seconds ready for them. Shocking though it is, not everyone in my house loves veggies. I, for one, can’t understand it. I could sauté an entire bunch of kale in coconut oil, eat it blissfully by my myself and…no one would say a thing. Instead of the sound of “Where’s mine? !” echoing through the house, there would be small sighs of relief. With that precedent set, I’m always on the lookout for ways to make veggies more palatable, perhaps even yummy. I made this sauce as a topping for steak one night, and some spilled over onto the evening’s broccoli. As soon as I heard, “Hey! This actually makes the broccoli taste good!”, I knew it would be a new staple. 1. Melt butter in pan over medium heat. 2. Stir in mushrooms. Cook until soft, about 5 minutes. Season with salt and garlic powder. 3. Add coconut milk and stir. 4. Sift or sprinkle arrowroot on top, being careful not to allow large lumps to form. Stir until smooth. 5. Serve over meat or veggies. 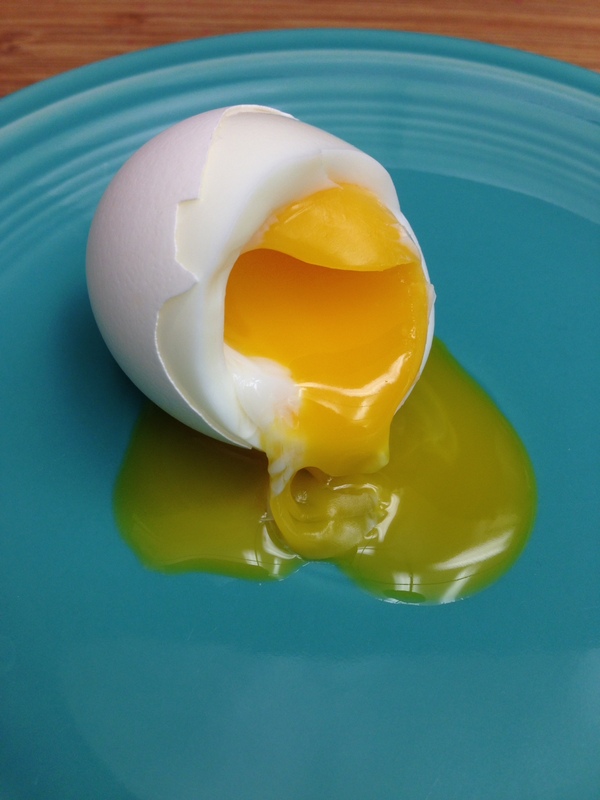 Few things bring me as much kitchen frustration as a badly boiled egg. They can go wrong in more ways than one, but by far the worst is the egg that states that it is perfectly happy living in the shell, and will fight tooth and nail to keep from parting ways with its thin, crackly home. The end result of that situation is an ugly, pock-marked egg that took two hours to get the shell bits off. Those eggs are salvageable, except for those two hours you’ll never get back, if the goal was egg salad, since you can relieve your frustrations by chopping the little jerk up. If, however, you were planning on serving deviled eggs, it’s all over. Despite perhaps being the world’s most perfect food, there’s something depressing about a deviled egg that looks like the surface of the moon. 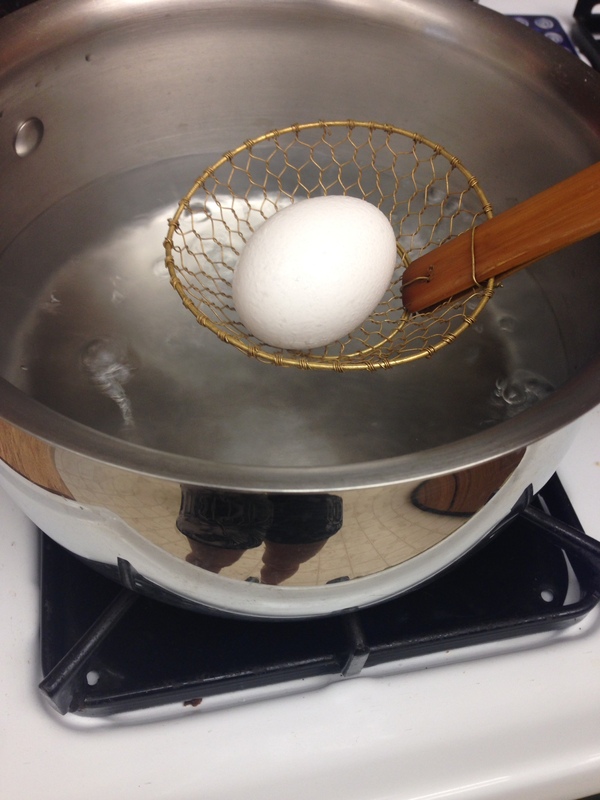 I’ve tried all the “tricks” for boiling eggs. Putting them in the water at different times, baking soda, ice baths. The results have varied wildly. Thankfully, all the experimentation has led me to my own foolproof method, which I discovered, of course, on accident. Fill a saucepan with 1 1/2” of water. Cover. Bring to a boil over medium-high heat. Gently add the eggs one at a time with a slotted or wire spoon. If they bounce off the bottom of the pot they may crack, so try to roll them off the spoon into the water. If one does crack, just continue to cook it. It will make a mess in the water, but will still be usable for egg salad or a snack. Partially cover the pot with the lid, leaving an opening for the steam. Set the timer! 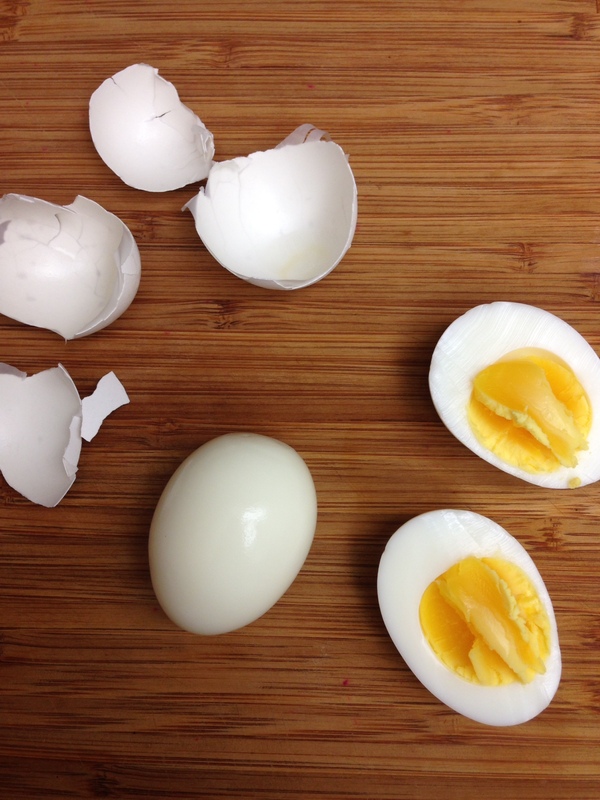 Ten minutes is perfect for snack eggs, egg salad, and deviled eggs. Much longer will be too much. The giveaway of an over cooked egg is the gray ring around the yolk. Five minutes is perfect for a nice runny yolk to feed to babies. Baby superfood in just 5 minutes. When the timer goes off, move the pot from the stove to the sink. 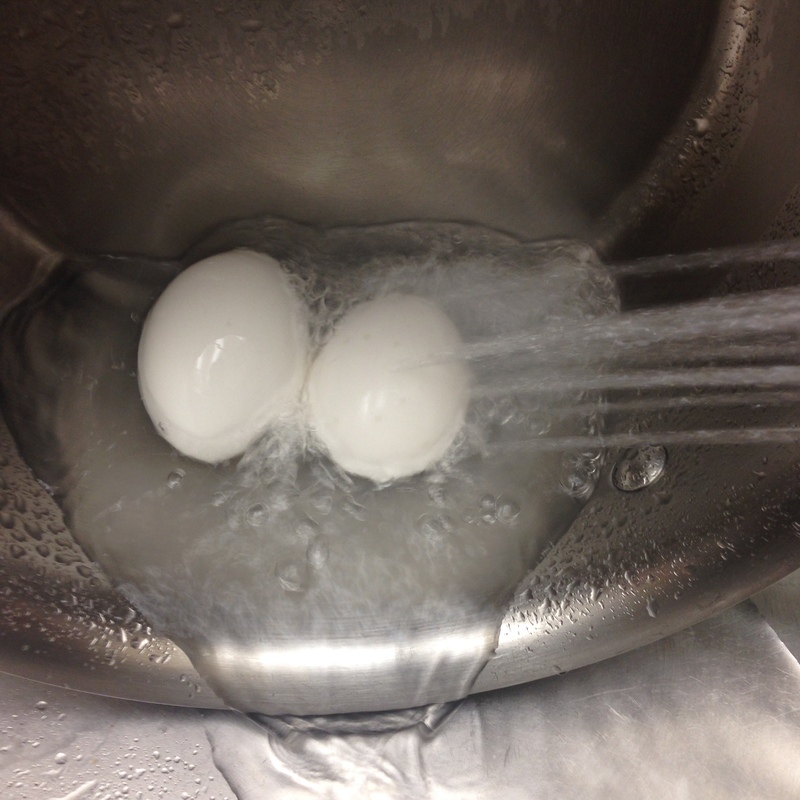 Tip the boiling water out while rinsing the eggs with cold water. Rinse just long enough to cool the eggs enough to handle. Voila! You should now have a lovely spread of perfectly peeled eggs ready for snacks, salads, and deviling! 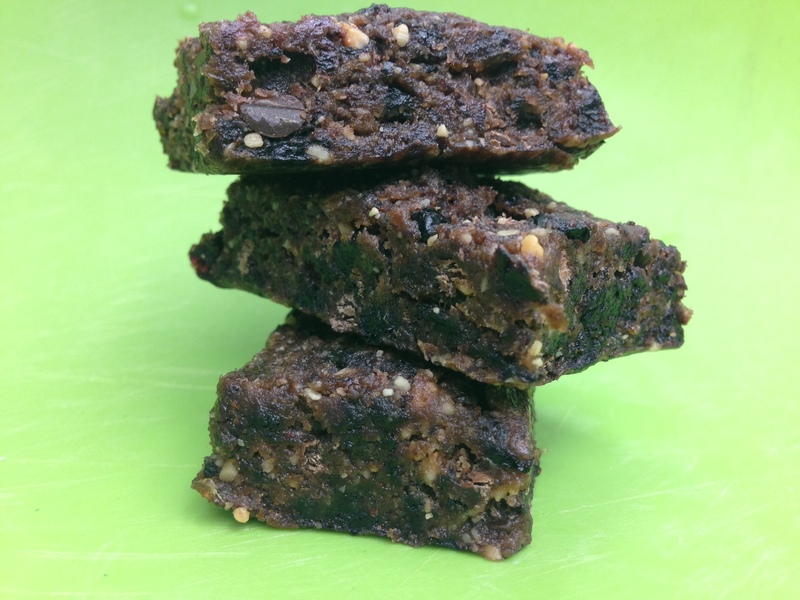 These date bars are easy, versatile, and travel well. I started experimenting with making bars two years ago as fuel for long trail runs and races. It turned out everyone in the family loved them, so we’ve made quite a few since then. 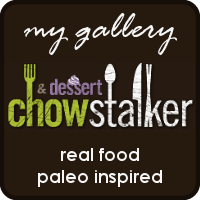 Beyond just squishing a handful of dates together, the possibilities are endless as far as tweaking the additional fruits, flavorings, and seasonings. This particular recipe came out really well. It calls for dried blueberries, which always come sweetened, but you can easily dry your own. Spread a package of fresh blueberries on a cookie sheet, and bake at 200℉ for 4-6 hours until the berries are shriveled. 1. Cut each date in half and remove the pit. Place all the dates in a food processor and process until they become a uniform ball. Remove the clump of dates to a mixing bowl. 2. Pour the blueberries, chocolate chips, and sea salt to the food processor and process until well chopped and mixed. Place these in the mixing bowl with the dates. 3. Add the almond butter to the mixing bowl and combine it all with a wooden spoon. It will be very thick, so spreading the mixture out then folding it back on itself can be effective. 4. Place a sheet of parchment paper over an 8×8 glass dish, then drop the mixture from the bowl into the middle of the paper. Use the spoon to spread the mixture into an even layer in the dish. 5. Refrigerate until firm, at least half an hour. Lift the entire thing out of the dish by the parchment paper, and cut into bars or bites. Store in the fridge to keep solid. A successful fishing trip a week ago led to piles and piles of salmon filets, which led to a week long extravaganza of marinating, smoking, and vacuum sealing. As an end result, we have an obscene amount of smoked salmon, which is nothing to complain about. My first impulse was to poach a few eggs and whip up some hollandaise sauce to smother the eggs and fish in together, but I was out of lemons, so these omelets were my backup. There were no complaints when I served them up Saturday morning! 1. Cut bacon into bite sized pieces, and place in pan over medium heat. 2. 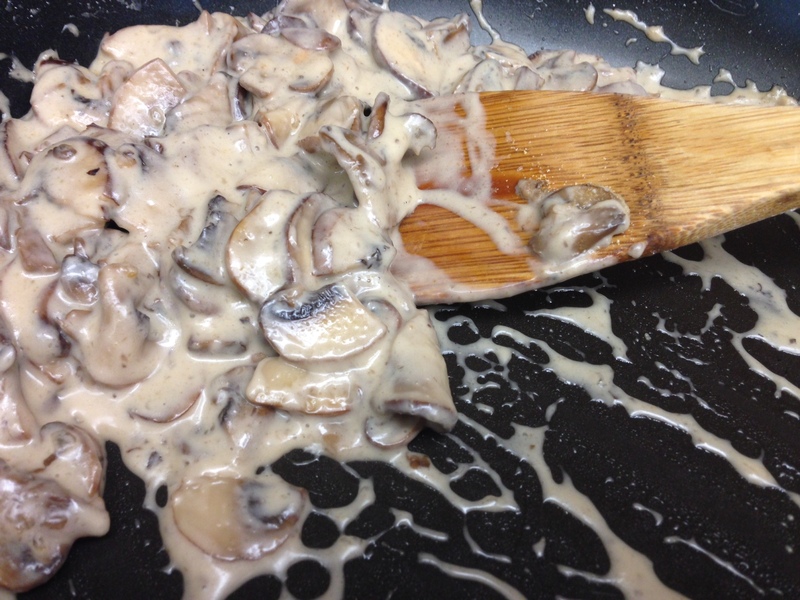 Allow to almost crisp on one side, then give them a quick stir and add the mushrooms. Stir occasionally until mushrooms are soft. 3. Break the salmon into bite sized pieces, making sure all bones are removed. 4. Add salmon and artichoke hearts. Season with salt, pepper, thyme, and garlic powder and stir. 5. When salmon and artichokes are just warm, turn off heat. 6. In a second pan, heat 1/2 tbsp of the butter or coconut oil over heat just below medium. 7. Beat 3 eggs in a small bowl and season with salt and pepper to taste. Pour egg mixture into pan. 8. Allow to cook undisturbed until about half the thickness of the egg is firm, about 2 minutes. 9. 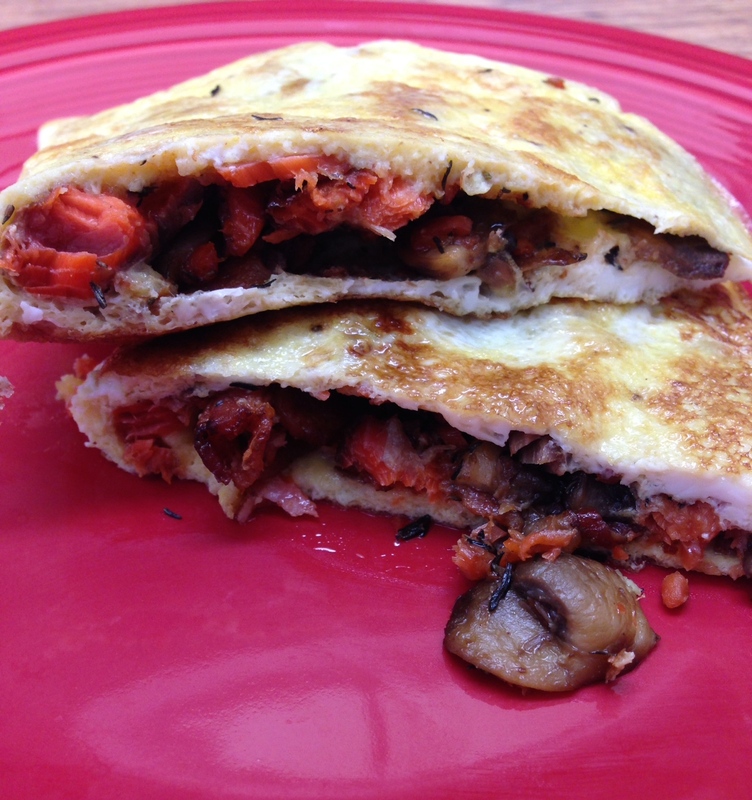 Top half of the egg with 1/3 of the salmon mixture and fold the egg in half over the salmon. Cook a minute more, then flip the omelet over to the other side and cook for an additional minute. 10. When egg is firm throughout, remove to a plate, and repeat steps 6-10 for remaining two omelets.